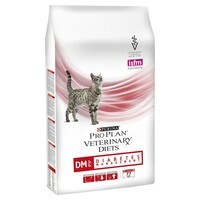 Purina Pro Plan Veterinary Diets DM St/Ox Diabetes Management Dry Cat Food is a complete diet that has been formulated to help regulate blood glucose (sugar) levels in diabetic adult cats. The formula contains low levels of carbohydrate to reduce the upsurge in blood glucose that happens after meals, and high levels of protein to help stimulate insulin release from the pancreas. Purina DM has also been shown to reduce insulin requirements in some diabetic cats and is also rich in the antioxidant vitamin E to help neutralise the free radicals produced with diabetes.